We’ve updated our list of the Best Home Gym Equipment 2018 with an all-new look at some of the best all-in-one home gyms that offer the perfect combination of functionality, compactness and versatility. The home gyms below offer the best value for their respective price category, and all come backed with enthusiastic reviews on Amazon. One new trend for best home gym equipment 2018 is the move into high-end cross-training machines that integrate strength training and cardio into one seamless workout. As a result, we’ve included a strength training/cardio combo NordicTrack home gym in the high to ultra-high price category. In addition, the overall trend toward electronic fitness trackers (as best represented by the nearly ubiquitous FitBit) in the health industry has really pushed the makers of all-in-one gyms to up their game when it comes to delivering a total home workout experience. For example, the NordicTrack Fusion CST ships with a 10-inch tablet computer that you can use to watch on-demand video exercise routines from world-class instructors. 1 Choosing the Best Home Gym Equipment. 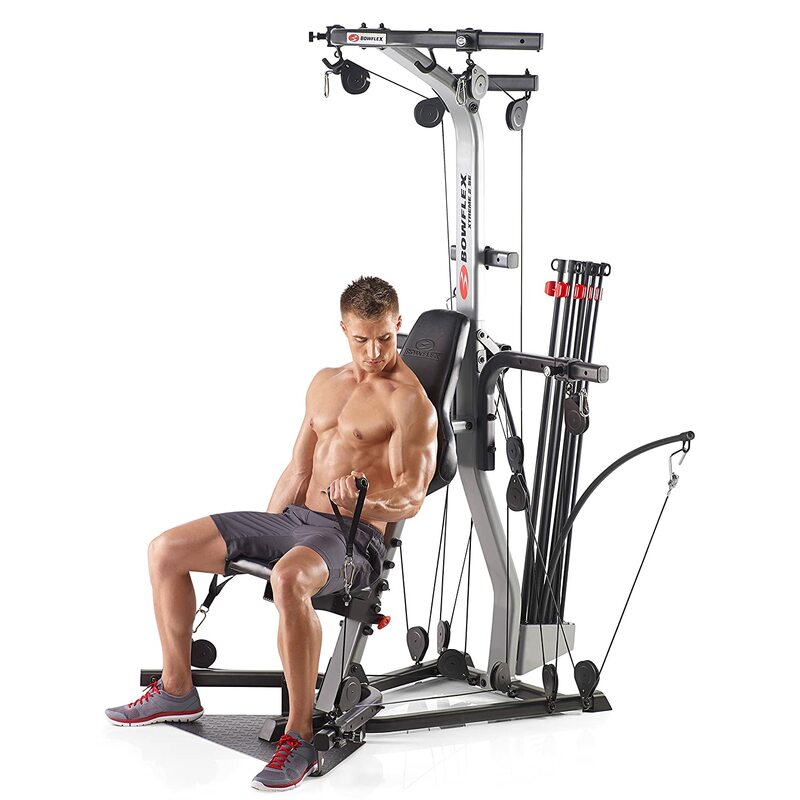 The Weider Ultimate Body Works and the Bowflex PR1000 as standouts in this price category. Even with new competitors in the marketplace, these two machines still rank as the best home gyms in the ultra-low to low price category. 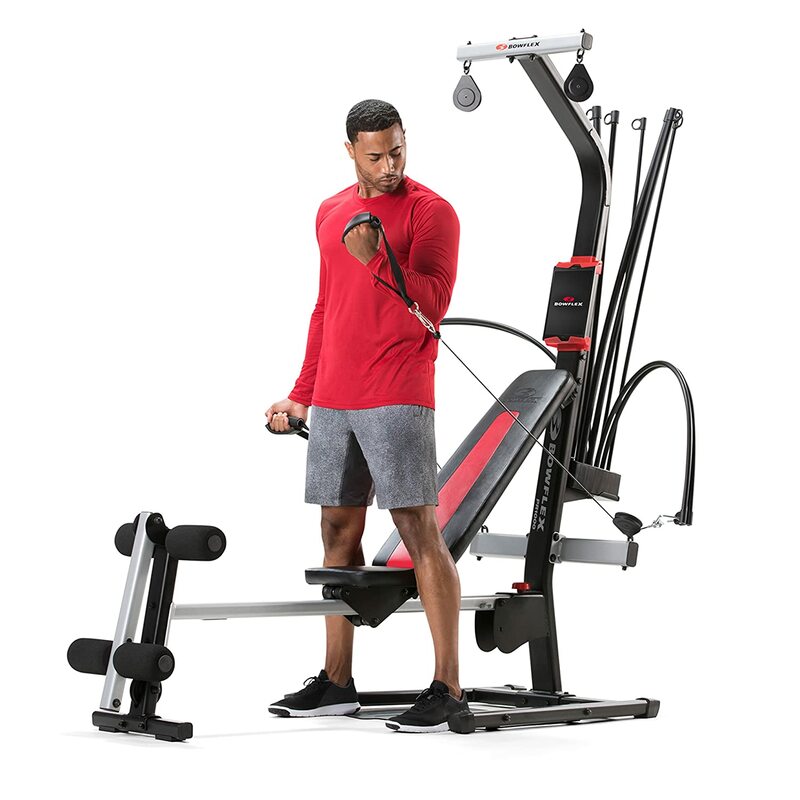 The Weider Ultimate Body Works is perhaps the best entry-level home gym on the marketplace today, and comes with an incline bench, resistance bands, and a cable-and-pulley system. For someone just getting started, this is the perfect introduction to what an all-in-one home gym can offer. 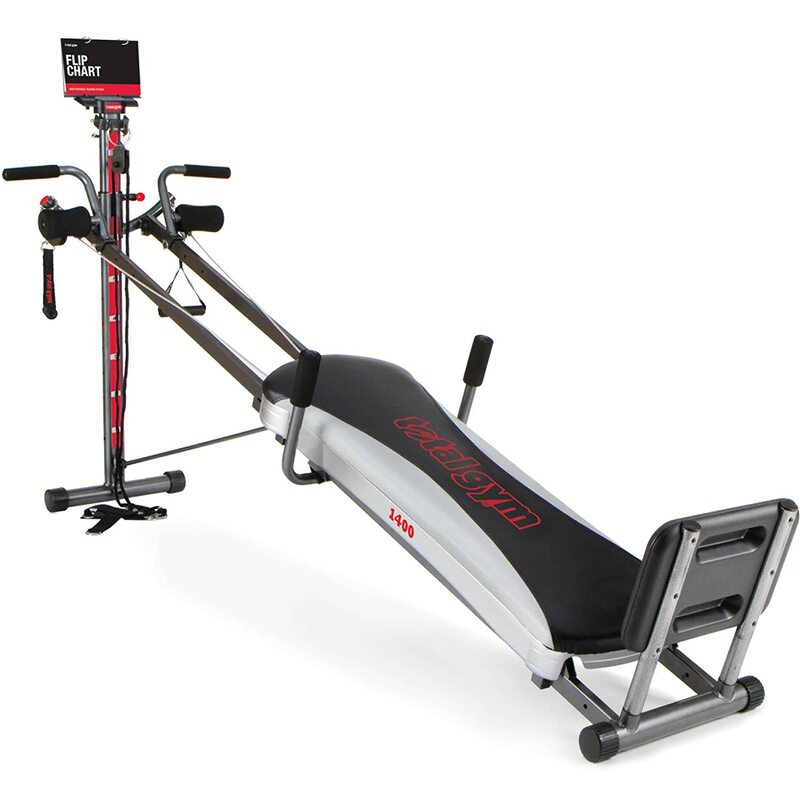 At a more advanced level, the Bowflex PR1000 uses patented Power Rod technology to deliver 200 pounds of resistance. Moreover, the bench easily converts into a rowing seat, so that you can add in some aerobic rowing activity with your strength training. The Bowflex PR1000 is optimized for 25 different exercises, all of which can be varied by changing the angle of resistance. ability of the best home gym equipment to offer 60 different strength, cardio and stretching exercises, all from the same machine. The Total Gym 1400 Deluxe is easy to set up in just 5 minutes, comes with a 50-minute workout DVD (perfect for the total beginner), and offers the ability to create workouts based on 12 different levels of difficulty. Simply adjust the incline bench to get a more difficult workout. Just as in the low range, Bowflex offers one of the best workout machines you’ll find at the next higher price tier: the Bowflex Blaze. 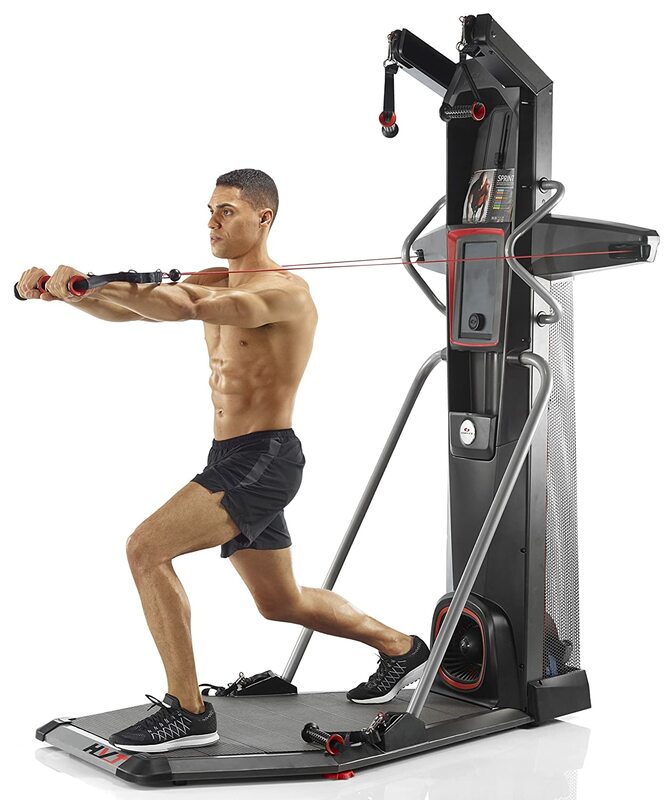 This machine delivers on the Bowflex promise to offer a full body workout, with a total of 60+ exercises available. The machine comes with 210 pounds of Power Rod resistance, but you can upgrade that number to 310 or 410 pounds, ensuring that you won’t outgrow this machine as you get stronger. Similar to the Bowflex PR1000, there is an aerobic rowing option for the Bowflex Blaze. 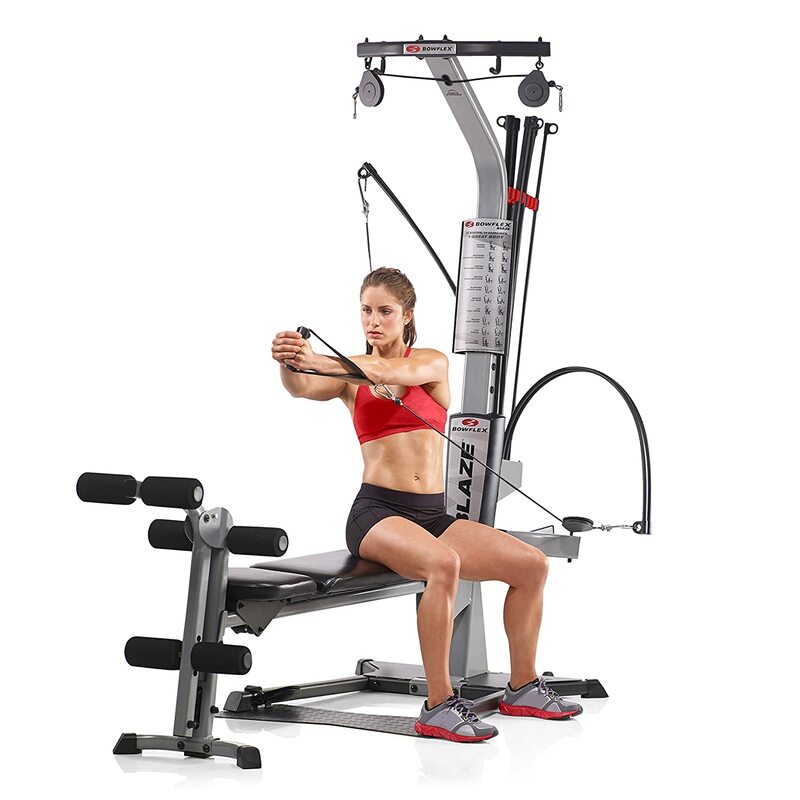 In addition, there is a leg press, a lat bar, a squat bar and multiple cable and pulley positions. Best of all, this Bowflex machine is compact, folding up to a respectable 52 inches by 38 inches when you are not working out. 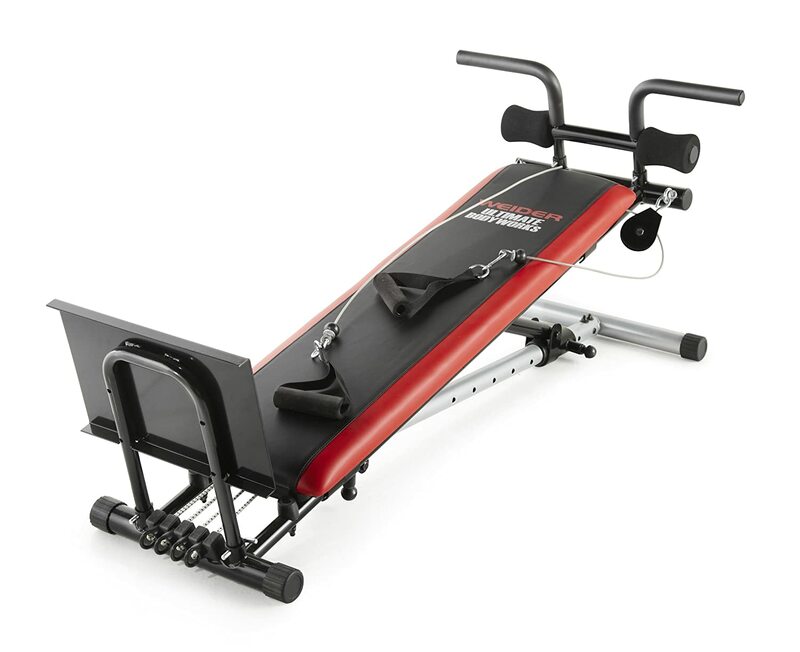 On Amazon, the Bowflex Blaze scored a 4.3/5.0 in customer reviews, making it an Amazon favorite. 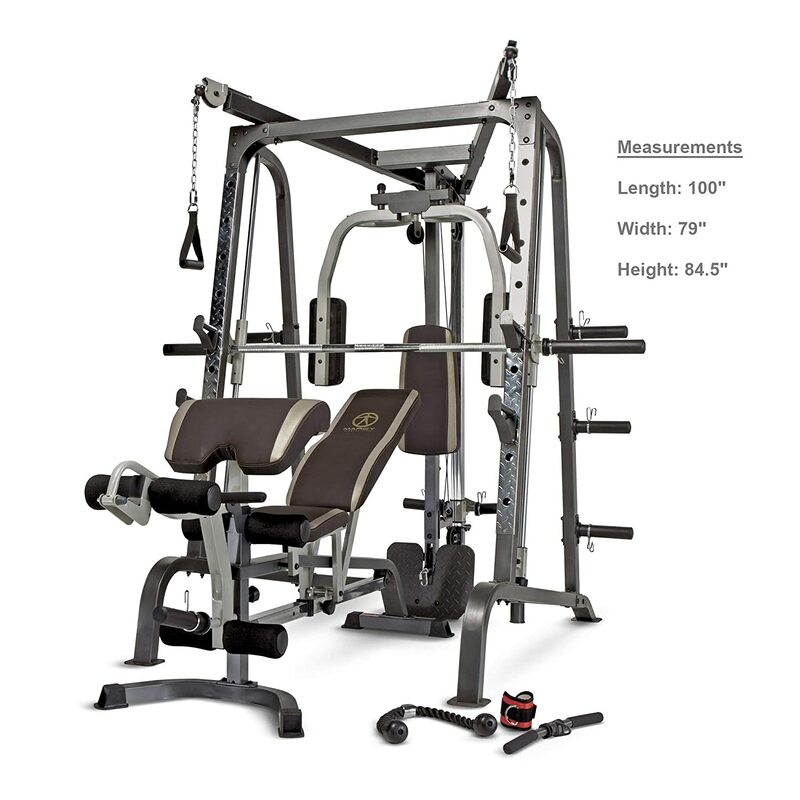 We’ve updated our rankings for Best Home Gyms 2018 by replacing the Marcy Combo Smith Machine (a favorite in past years) with the Marcy Smith Cage Workout Machine. This is the type of workout machine you might see at your neighborhood gym. It boasts a heavy-duty, steel frame, an Olympic free-weight track and a much larger footprint than the other machines featured here. 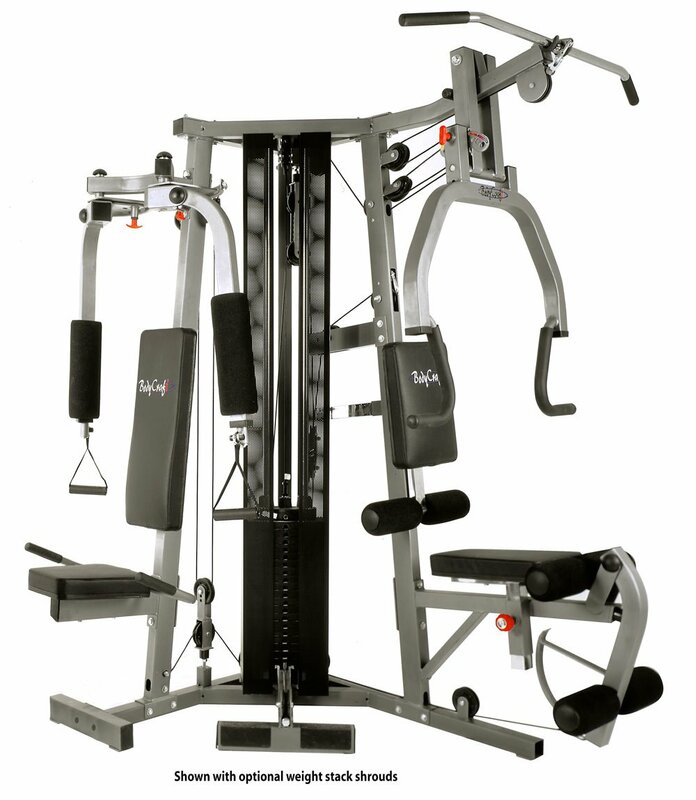 The increased size and sturdiness of the Marcy Combo Smith Machine is a real advantage because it enables you to go very aggressive on your strength training with a range of features, like a dual-action leg developer and a multifunction arm press. However, this size can be a negative, because it’s also a lot harder to cram into a small home and a lot heavier to ship. If you are really looking to build muscle in 2018, though, you’ll love the linear bearing mechanism of the Marcy Smith Cage Workout Machine, which delivers a smooth range of motion while working out. The best home gym machine that you will absolutely fall in love with in 2018 is the NordicTrack Fusion CST. It’s pricey, but it will completely change your idea of what a high-end home workout is supposed to be. First of all, it enables you to try 100+ exercises, and comes with a small, 42-inch footprint. The machine is emblematic of the trend toward cross-training machines that offer high-energy cardio alongside low-impact strength training (which works via magnetic resistance, so you don’t have to worry about heavy weight stacks). And the Nordic Track Fusion CST totally gets the trend toward digital coaching and digital fitness tracking. Starting in mid-2017, the Nordic Track Fusion CST started shipping with a 10-inch tablet that you can use for on-demand exercise videos, live classes, and even recipe suggestions. You’ll work out twice as hard when you have a gym personal trainer on your tablet. The closest competitor to the NordicTrack Fusion CST is the Bowflex HVT, which is the high-end machine you’ll see featured on the Bowflex website right now. 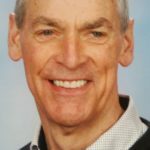 HVT stands for High Velocity Training, and that strategic shift into interval training marks a real departure for Bowflex, which has always focused on its Power Rod technology as a key selling point for its machines. But that’s why we singled out the strength training/cardio trend as one of the most powerful trends in the home gym space for 2018 – it’s really forcing all the biggest names in the business to reinvent their gyms as combo strength/cardio machines. At a comparable price point, our favorite product from Bowflex is actually the Bowflex Xtreme 2SE. Everything the Bowflex Blaze can do, this machine can do better. A worthy runner-up in this high to ultra-high category is the Bodycraft Galena Pro Home Gym, which we profiled last year as well. Choosing the Best Home Gym Equipment. The top fitness brands – such as Bowflex, Marcy and Weider – continue to produce high-quality all-in-one home workout machines at a variety of price points. Based on your overall goals and fitness level, it’s easy to find one amongst our best home gym equipment 2018 that is perfect for a complete workout experience. For instant access to the best prices and discounts on Amazon, click the links above for more product information and easy ordering.